All of a sudden, it's cold here. One day, it was an unusually warm (80 degrees) day for November, and the next it was in the 30s and 40s. But, I'm ready for it. I've been craving warm, comforting foods and all else that autumn entails...fires in the fireplace, hot tea and cocoa, lazy weekend days, early-to-bed evenings, and the possibility of snow days. Plus, I'm excited to see lots of fresh fall foods at the grocery store...apples, pears, squashes, cabbages, cranberries, chestnuts, and pomegranates. I've eaten many a pomegranate in my day...my mom used to buy them all autumn long. We'd sit in the living room, in front of the television with a big bowl in our laps, tearing the fruits apart to get at the seeds. This fall, I'm going to try several recipes that feature pomegranate seeds. The first is an easy ice cream recipe from Nigella Lawson's Nigella Express cookbook. All you do is juice, whisk, and freeze to create a "delicate pink ice cream [that] tastes like fragrant, sherbey heaven." Juice the pomegranates and the lime and strain the juices into a bowl. You should have about 3/4 cup of juice. I plucked all the seeds & pulsed them in the food processor before straining. Add the powdered sugar to the juice and whisk to dissolve. Whisk in the cream until soft peaks form. Spoon & smooth the ice cream into the airtight container and freeze for at least 4 hours or overnight. 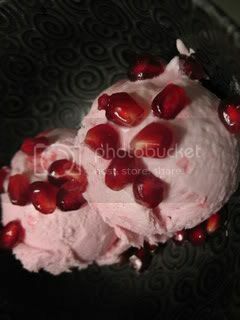 Scatter with extra pomegranate seeds when you serve. Yum! I've been seeing this recipe around the web...and I really want to try it! It looks so good!